WordPress is by far the most popular blogging system in the world. There are so many themes, templates and additions available for this fantastic piece of software that even the largest companies in the world are using WordPress to manage their websites. After all, why create a new thing when you already have something that is available and easy-to-use? WordPress is also a pretty good method for uploading and sharing files, particularly PDF documents. Let’s take a little look at how with the aid of a couple of translation tools you will be able to create a website in WordPress that generates you a little bit of money. WordPress is an extremely popular blogging platform because it is one of the best ways for a novice to start writing online. Some bloggers and website owners also make some extra income through their site. All they need is a few blog posts, some advertising in place and marketing to get visitors coming to the site. Of course, the best way to get as wide audience as possible is by posting articles and PDF documents in English. Unfortunately, not everybody is able to write with ease in English and thus it is best for them to write their document in their own language then translate it to English. All you need to do is type your document out in Word and save it as a PDF file. After that it is a simple case of feeding the PDF through a translation machine and picking up the newly converted file at the end of it. If you find that the translation is not good enough then you can find a lot of translation help out there on the Internet. Once you have your translated file then you are ready to upload. Type out whatever text you want to add into your WordPress blog post, perhaps something that introduces your document? Click the ‘Add Media’ Button. Select the file that you want to upload, in this case find the location of the PDF file that has been translated. Hit that upload button and wait. Your PDF file should upload pretty quickly. Once it is done a new window with a bit of information will be opened. Fill in the document information as precisely as you want. Click the ‘File URL’ button. Publish your blog post. You will notice that your PDF document will have been linked to your post and it is downloadable or viewable online. That’s it. Once you have your PDF documents written (and translated) then the process is incredibly simple. Just upload your document and begin to spread the word about your website. 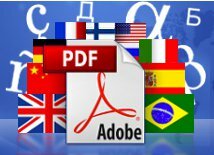 Translate your PDFs with Multilizer. Get your PDF documents translated automatically with just a few clicks. 27 languages supported. Test with a Free version. Click here to read more. Next Next post: Customized Machine Translation Fits Well in Translating Technical Text?